Thank you for participating in the joint webinar from ColorID & Entrust Datacard. Included on this page is additional information covering specific products & services mentioned during the webinar. ​Contact ColorID if you'd like to discuss your identification needs today! ColorID’s CHOICE program offers organizations a cost effective approach to support the evolution and advancement of identity management solutions institution wide. 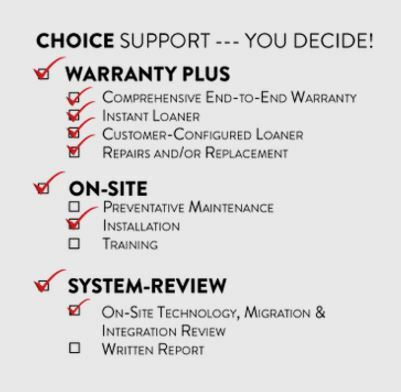 Unlike many other “On-Site” service programs that offer limited flexibility and can be costly, ColorID’s CHOICE program offers a comprehensive approach and the ability to build a custom support program – simply select from a full menu of service options. Institution identity management and access technologies are rapidly changing and this can create many challenges for organization departments, key stakeholders and end-users. ColorID’s CHOICE program provides institution’s strategic stakeholders and team members a collaborative approach with some of ColorID’s highly experienced identity experts. Together, we can develop and support a customized, future forward identity road map that includes best practices and best in class products and services for you. When you need to issue credentials with higher levels of security, Datacard® TruCredential™ Professional software provides a next-generation solution. Datacard SD460 with Mag is the latest professional series printer, perfect for large scale printing needs that need overlaminate for added protection along with the new optional tactile impression feature.